A man from Limpopo can be seen on film hurting an officer after apparently thinking the cop was trying to shoot him. It was reported on Friday that a 26-year-old man believed to be a farmer was arrested after he allegedly “became impatient” and assaulted an officer at a station he had gone to to report a robbery. Limpopo police spokesperson Brigadier Motlafela Mojapelo confirmed to News24 that the incident took place at the Roedtan police station last week Saturday. Mojapelo told the website the man had appeared in the Mookgopong Magistrate’s Court and was granted R500 bail after the case was postponed to May 3. 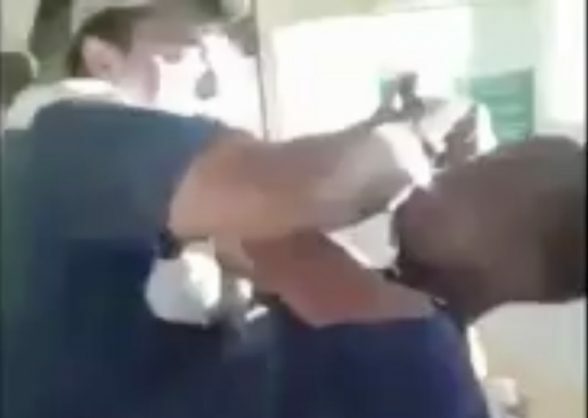 In the video, the farmer repeatedly alleges that the officers wanted to shoot him. It’s unclear if he may in fact have mental health problems. The man later kicks the officer, who was named as 50-year-old Warrant Officer Godfrey Matlala to News24. Mokapelo said that prior to the incident, the 26-year-old man had come into the police station with his wife to lodge a complaint about a theft. According to the spokesperson, the man assaulted the officer after he took a rifle out of a safe. It appears from watching the video that the man was convinced that the officer had intended to shoot him. The Police and Prisons Civil Rights Union (Popcru) alleged that the incident was racist.